Many know her as the daughter of George Bonfiglio, founder of the 27th Lancers Drum and Bugle Corps and founding father of Drum Corps International. 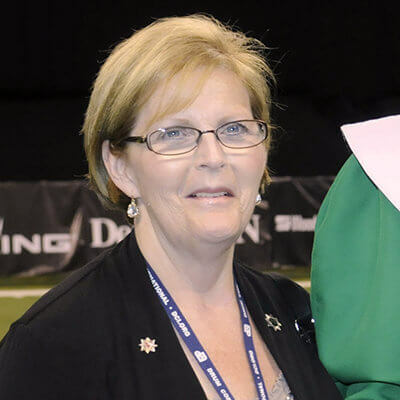 However, Denise Bonfiglio has paved her own impressive path through the drum corps activity via a career that’s already lasted more than 50 years. Growing up on the east coast, Bonfiglio joined the Immaculate Conception Reveries before becoming a member of her father’s 27th Lancers. She excelled as a member of the corps’ color guard and stayed on as an instructor after aging out, teaching the unit’s legendary rifle line. After the 27th Lancers ceased operations as a DCI drum corps in 1986, Bonfiglio brought her talents to other corps, including the Garfield Cadets and Star of Indiana. In 1987, she spearheaded the reintroduction of a rifle line into the Cadets’ color guard section. Bonfiglio worked with the 1987 Cadets to shape an inexperienced group of performers into a cohesive and competitive unit. Among the members she taught to spin a rifle that year was April Gilligan, who became a Bonfiglio protégé and later led corps’ color guard section as caption head. Since the 2000s, Bonfiglio has worked with Santa Clara Vanguard and in recent years has served as the corps’ staff coordinator. In that position she plays an important role as a liaison and facilitator between the organization’s design staff, instructional staff, and management and administrative teams. In parallel with her drum corps activities, Bonfiglio has also been a widely regarded and respected individual within the Winter Guard International community. In 2000, she was inducted into the WGI Hall of Fame. In 2006, she was instrumental in reinstating the Santa Clara Vanguard Winter Guard program, an award-winning group with which she currently serves as director. With an eye on the past and one on the future, Bonfiglio co-founded the 27th Lancers Foundation with her sister Janine McWilliams. The non-profit organization, in honor of their late parents George and Patsy, raises funds to provide scholarships awarded to DCI corps members on an annual basis. And therein is perhaps Bonfiglio’s greatest achievement in drum corps—her willingness to teach and mentor up-and-coming talent while planting the seeds for future generations of corps members to perform and thrive.